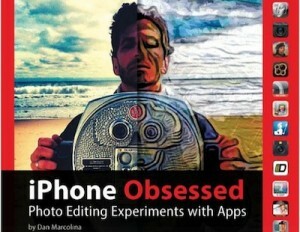 iPhone Obsessed – the iPhone photography book I wanted to write! The concept was simple, but to pull it off meant a lot of work. I set about taking photos with my iPhone and editing them with a variety of iPhone photo editing apps. I then showed the original and the final options with effects applied. It has been a lot of fun over the last year, and it has been a serious lot of work for a year. Over the holidays, I found and purchased “iPhone Obsessed“. A book that shows finished images and the app/settings it took to get the image. The author claims it took them a year of hard work to take the photos and work through the best solution to get the effect they were looking for. Having lived a similar year, I can say I believe them. The book is a very nice item to grab (found it on Amazon here) to save yourself many hours to playing around. It is still best to experiment to learn what you can do and equally what doesn’t work. But iPhone Obsessed takes a lot of guess work out of getting to the finished result you may be looking for. It’s a great way of ‘seeing’ ideas around what is possible when you frame up a shot too.